THE SHOW IS FULLY BOOKED. THE ONLY CHANCE OF GETTING IN IS BY COMING TO THE THEATRE AND WAITING TO SEE IF ANY SPACE IS AVAILABLE. Get ready for Cinderella our 15th pantomime! Boasting one of the best shows on the Costa Blanca, Networks Theatre in Orihuela always brings you a brilliant pantomime! This year’s show is no exc eption. Cinderella is packed with great songs, brilliant choreography, knock-a-bout comedy and fabulous costumes. Our Artistic Director Nick Moore and Dennis Carpenter will be playing Ugly Sisters Annie and Fanny and Networks’ favourite Pilar Fernandez will be Baroness Hardup! The show is really a wonderful example of what English pantomime is all about! Come along and join us! 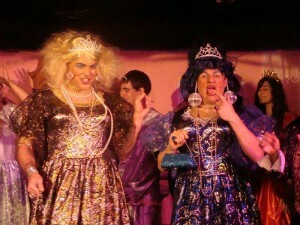 Nick Moore’s script will have you crying with laughter and you’ll be marvelling at Dennis Carpenter’s amazing costumes. Cap it all with a young and energetic cast you’ll have a night to remember in our very own theatre in the heart of Orihuela! There are only four public performances! So early booking is essential! Make sure you reserve now! Pop by the theatre to pay for the tickets in advance or make sure they are collected thirty minutes before the show!